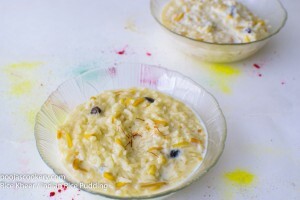 Kheer or Payasam is Indian Pudding which is prepared mostly during festive Seasons, and I prepared rice kheer today to celebrate Holi, the Festival of colors. Rice kheer is one of the popular desserts recipe cooked in North India along with Phirni and seviya kheer(Vermicelli kheer). You can either prepare this kheer using cooked rice or uncooked rice. If you have any left over rice, then you can use them too, to prepare this kheer or payas. The flavors are added using cardamom powder , nutmeg powder or cloves. Added nuts and raisins gives it extra crunch. So let’s see how to make rice kheer. If you are looking for more festival sweets, then check out rasmalai, Wheat Ladoos, dudh pedha, Mysore Pak and many more. In a medium saucepan, kept on medium heat, take ghee and once it melts, add cloves, raisins and almonds. Fry them for a few seconds until the raisins are all puffed up. Remove them in a bowl and keep aside. In the same saucepan,mix together cooked rice, milk, condensed milk and sugar. Keep it on high flame and let it come to boil.